The operator was constructing additional storage tank capacity and had to comply with the safety regulations laid down by the MB Lal Committee, requiring the installation of failsafe actuators for critical tank farm applications. These valves, known as Remote Operated Shut-off Valves (ROSOV), now provide tank overfill protection at the majority of storage facilities owned by the Indian oil industry. The local engineering company appointed as the consultant for design and engineering was initially unclear about the specification of actuators for ROSOV, and was opting to go with a pneumatic failsafe solution. The Rotork Skilmatic SI range of self-contained electro-hydraulic actuators, combining the simplicity of electrical operation with the precision of hydraulic control and the reliability of mechanical spring-return, has been widely adopted for ROSOV applications around the world. Rotork therefore worked very closely with the consultant and the end user, providing Skilmatic tank farm application details and reference lists, organising technical presentations and live product demos. This resulted in the decision to adopt the electro-hydraulic solution in the specification for the project. 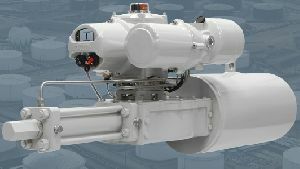 Reliability and safety were key factors for the application together with a requirement for a self-contained, fully integrated actuator with intelligent non-intrusive features and a hand-held setting tool. The latest generation SI3 actuator supplied on this contract has an enhanced specification and increased torque output range of 65 Nm to 500,000 Nm. The SI3 also offers a wide range of operating speeds, additional ESD options with single or dual inputs, and communication capabilities to suit many diverse applications. Find out more about the SI3.